The 'Dart-Boards' Project: BoardOff Design Tool delivers its first board - get a copy. BoardOff Design Tool delivers its first board - get a copy. 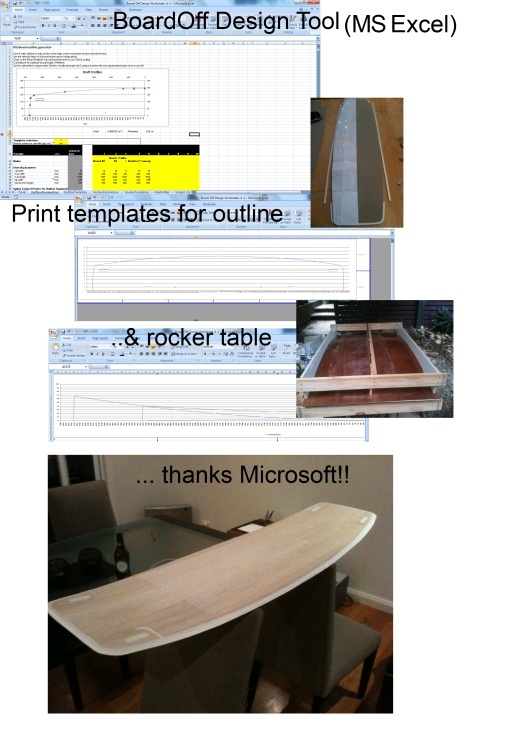 This board was designed entirely using BoardOff Design Tool I put together in MS Excel 2007. It lets you design the outline of the board using cubic splines, the rocker table center and outer jigs ( for continuous rocker only at the moment) taking account of the rocker table width, estimates the flex profile (beta at the moment) and takes a stab at the weight. You can have a free copy of v1.3.3 by clicking on the link below. It has been designed on MS Excel 2007 and is a macro enabled xls file (.xlsm). I have used third party macros in it for the splines and a beta version of DXF export so scan it with your virus software if you're concerned. If you find it useful or have any suggestions it would be great to hear from you. In the end I'd like to get some folks with development skills involved and turn this into an open source desktop application ..... anyone, anyone??? I would suggest to put your worksheet on DropBox and provide download link here. You won't be able to track down number of downloads but it's easier and works really well. The Sourceforge might be good for tracking downloads. Thanks for the tip Dean. I put the spreadsheet up on google docs and replaced the email with a link to it. Had a great response so far. Modified this so that clicking on the link generates a request from statcounter for the tracking image. Cool, thanks for posting, didn't know that! Yep, I've checked worksheet file, looks so complicated:) A lot of science in it and it looks great!